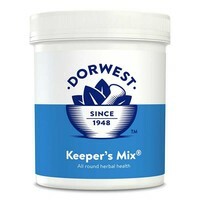 Dorwest Keeper’s Mix for Dogs and Cats is a dietary supplement based on a traditional formula from a Dorset gamekeeper and kennel-man, brought up-to-date with the benefit of modern herbal knowledge. Containing an impressive 8 ingredients with a careful blend of natural antioxidants, vitamins, minerals, chlorophyll, fibres and complex bioactive compounds, Dorwest Keeper’s Mix promotes a thick health coat, and has a positive effect on many organs and supports their functions to help maintain the body’s natural balance. Best introduced gradually to the feed to improve acceptability.